Breckenridge, famous for snow, service and sunshine, is the number 1 choice in the US for British skiers. Breckenridge has maintained its 'Old West' charm of the gold mining era and successfully combines a fun and friendly atmosphere with a fantastic ski area. It is very popular with first-time visitors to Colorado. 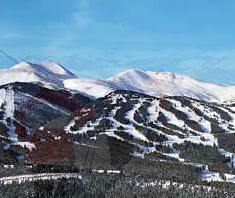 Keystone, located a short distance from Breckenridge, is a sprawling resort of condominiums. There is no clear centre but a division of neighbourhoods linked by buses. At River Run, at the base of the main gondola, a new development is set to become the focal point of the resort. At 9,600ft, Breckenridge is the highest resort in America, with a huge ski area and slopes runs down into the village. Situated in the heart of the Rockies, its one of the closest resorts to Denver Airport. Breckenridge has good snow conditions, but Keystone's natural snowfall is low by Colorado standards. Shortage of snow is rarely a problem however, especially because Keystone has one of the world's biggest snow making system. The altitude could course health problems, such as dehydration, nausea and headaches. Visitors should drink lots of water and abstain from alcohol. There are four main ski areas- Peak 7, 8, 9 & 10. There is a a great network of tree-lined blue and black runs across all the peaks. The town is renowned as a lively town with lots of pubs and restaurants. There are a couple of nightclubs for partygoers. There are plenty of boutiques, art galleries and ski shops. Christmas lights and decorations remain throughout the season and there are a number of winter festivals, including an ice-sculpture competition. Longer-term, there are plans to build villages at Peaks 7 and 8 and to link them to town by gondola. Since Keystone's slopes are impressive, its unfortunate that there is a lack of a real village at their base. Keystone's snow making facilities usually allows it to be one of the first US resorts to open- usually in October! Keystone is less compelling, but probably more friendly than Breckenridge. Price is probably its main advantage. There is good value accommodation, but a hire-car is recommended to compensate the lack of shops if you're self-catering, or plan to eat out more often than not. There are three main interlinked mountains, however only one, 'Keystone Mountain', is accessible directly from the village. Lifts serve 'North Peak' and 'The Outback' from Keystone Mountain. a good choice of lively bars. try The Brewery.